What happens when we die? Does god protect us? How should we live our lives? These are all questions that have been pondered throughout humanity and are the questions at the centre of Terrence Malick’s latest, The Tree of Life. These are questions that neither humanity nor Malick can provide any answer to and on the basis of this film another question that Malick cannot answer is, how do you make a coherent film? I will preface this by review by stating that this is the first Terrence Malick film I have seen and therefore I am new to his style of cinema. I have nothing against films dominated by style and imagery and in my review of Sucker Punch I defended Zack Snyder, as I believe he is a director who makes visually dense films that demand a big screen viewing. While I am not comparing Zack Snyder and Terrence Malick as filmmakers of the same ilk I believe that both of their 2011 offerings suffer the same fate and that is one of self indulgence and a lack of coherence and focus when it comes to the plot and characters. 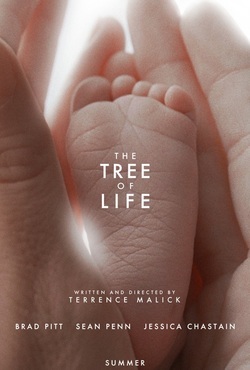 The story of The Tree of Life is one that is hard to put into words due to the fact that it is not words that Malick elects to use in order to portray his themes. Dialogue is secondary to the force of nature, in a film that for a large section of the running time feels more like an overblown Plant Earth documentary yet instead of Richard Attenborough we get whispered narration. There are three distinct elements to the film which make up the narrative, with only one of them truly succeeding and none of them adding up to a coherent whole. One section of the films story deals with the creation of the universe, planet earth and intelligent life, sequences that while beautifully shot deeply distort the films pacing early into the picture and lack any significant connection to the films other two elements. It is these other two elements of the films narrative that involve the performances of Brad Pitt, Sean Penn and Jessica Chastain. One of which contains the films strongest moments and take place in 1950’s Texas, where a young child is torn between the way of nature and the way of grace symbolized through his strict father (Played by Brad Pitt) and his loving mother (Played by Jessica Chastain) it is this movement of the film where The Tree of Life succeeds as a moving, relatable and at times intense drama about the struggles of family, childhood and life. The films best moments are the subtle ones, where the performances and the characters stand out. All of this is connected to Sean Penn’s modern day depression, where he feels lost, melancholic and nostalgic as he stares at the skyscrapers around him. It is this strand of the narrative, which is given the least amount of screen time and therefore has less impact. A potentially good performance from Sean Penn is wasted and his role amounts to nothing more than a brief cameo and never really connects with the audience and never feels as strongly connected to the 1950’s setting as it could and should. The Tree of Life is an incredibly hard film to sit through and at 138 minutes it feels much longer. Malick does not make it easy on the viewer and despite the presence of Brad Pitt and the summer release date this is not a film for a mainstream audience. When the film premiered at the Cannes film festival it was met with a mix of boos and applause, this is a polarizing film which some critics are hailing as a masterpiece while others are criticizing it for being a self indulgent, messy, tedious nonsensical piece of waffle. After one viewing of the film I agree with the latter although I do not feel the film is completely without merit as there are moments of great filmmaking trapped within this film. The Tree of Life is a film that as I noted above fails to feel like a connected and coherent piece, while many are saying this is an intentional move from Malick in order to mimic the way in which adults remember their childhood it does not make the film any less confusing or tedious to sit through. Infact tedious is a word that I believe perfectly sums up large sections of this film; quite frankly the philosophical element of the film that characters spew out through whispers was annoying as soon as it happened. Infact it is Jessica Chastain who in my opinion gives the films most underwhelming performance as her role amounts to nothing more than crying, gazing into the distance and whispering. The films creation of life sequence is also a big problem for the film. It is long and greatly disrupts the flow of the picture. I have read that Malick plans to release a companion piece documentary to this film called The Voyage of Time in IMAX with Brad Pitt narration, which expands upon this creation of time sequence. Quite frankly Malick should have taken his entire creation of life sequence out of The Tree of Life and into The Voyage of Time. The fact that he plans to use some of that footage in a separate piece altogether proves that this element does not work within the context of this film. As a stand alone IMAX imagining of the creation of the universe I would have been wowed and blown away, however within the context of The Tree of Life I found my wonder with the cinematography and music of this sequence being constantly hampered by my growing sense of frustration and bemusement. Another flaw within The Tree of Life is the fact that the themes and questions that Malick wishes to portray and pose did not need to be explored in two and more hours across three different plot strands. The films effectiveness is brought crashing down as Malick overreaches and tries to achieve too much. While I admire Malick’s ambition and I appreciate that he was trying to make more of an experience than a conventional film and that is something to be respected given the amount of depressingly poor conventional and predictable films that Hollywood releases. However the ambition while being something I appreciate is something that causes the film to ultimately fail rather than to soar. I found myself thinking that if a less critically respected director had made this, somebody like M. Night Shyamalan or Richard Kelly it would be slammed for the pretentious and self-indulgent film that it is. Many of the critics who are failing over themselves to praise the ambition of The Tree of Life were most likely failing to do the same thing for a film such as Southland Tales. The Tree of Life is a film that many critics are praising as it is being insinuated by many with a deep passion for film that basically if you don’t like or appreciate The Tree of Life then you are an idiot who does not appreciate true filmmaking art. I find this immediate snobby response to anybody who criticizes The Tree of Life across multiple Internet forums to be sketchy and rather ignorant as well as arrogant. One thing that does not help the film is the lack of focus on the characters and a character change regarding Brad Pitts character late in the film feels very rushed and forced and builds to a perplexing, out of control and pretentious climax. It is Brad Pitt who gives the films best performance and is at the centre of the films most memorable scenes. It is frustrating to see Malick do such good work with the family element of the narrative and not exploit it to its full potential. Malick did not need these long beginning of time symbolism and imagery to emphasize these themes, it seems as if Malick needs teaching the simple lesson that less really is more. All the themes of the struggles of life and the role of god could have been explored in the prism of the 1950’s family drama, yet Malick did not have an interest in focusing on the characters and the story and while that is the film he wanted to make it is not a film that is ultimately satisfying to see. Many are discussing whether Brad Pitt or the impressive Hunter McCracken is the lead actor of the piece, however due to Malick’s vision ultimately there is no leading actor in this film, they all fall victim to and are all supporting the trees and nature. The cinematography is rightly being cited as gorgeous and a highlight of the film, despite the fact that this film is tough to sit through and tests the audiences patience it is a film that is best seen on the big screen and as a fan of cinema I admire films with that quality. As I said however the scenes that really stuck with me were the small ones, with the best moment of the film for me being a dinner table confrontation where Brad Pitt and his sons comes to blows after one of the sons asks him to be quiet. Ultimately The Tree of Life is a film that while full of ambition, is gorgeous to watch at times and contains one of the performances of the year from Brad Pitt is ultimately an infuriating, frustrating, disjointed, incoherent experience with elements that never come together as Malick goes too far with his ambition resulting in great self indulgence and pretentious movements. I have read that Malick’s films are ones that grow with you over the years and get better on repeat viewings. While not completely without merit I do not think I could sit through The Tree of Life again and while I am not completely denying the possibility that this film will mean more to me as I grow older, as of now this if a film that I ultimately deem as a disappointing failure. Rating: No rating for this film as I honestly do not believe this a film that I can place on a rank of 1 to 10. A low rating of 0-4 would undermine the ambition shown with this film and some of the great filmmaking moments, all of which do not deserve to be ranked alongside other films that would be ranked 1-4. However any ranking of 5 or above is giving too much credit to a film that does not come together and is ultimately too long, too ambitious and too dense for its own good. A middle-aged man (Sean Penn) remembers his childhood in the 50's. Filming is literally a matter of life and death for director Terrence Malick. Time is running out: beauty will save us all. His new film is a collection of striking visuals, some of them staying with me since I saw the film yesterday: Jessica Chastain dancing in the air, a buried boy seen from under the ground, a woman meeting younger versions of herself, a house in the water, ... Malick is a truly gifted director; "The Tree of Life" is like nothing you will see this year. That being said, I unfortunately failed to connect to the characters, a serious issue for a character-driven drama. In my opinion, the crucial "space segment" arrives way too soon in the film, before we could even relate to Sean Penn's character and what he's been through. Childhood memories then become the best part of the film, but here again I felt the characters were quite one-dimensional. I am even more worried by the fact that neither me nor my friends could explain which one of the two younger brothers died, although his death becomes the main character's trauma. Like Gaspar Noé's "Enter the Void", I enjoyed the ride but felt the film could easily be one-hour shorter. But, wait a minute, terms like "main character" or "plot" actually do not apply to "The Tree of Life". "Did I miss something ?" asks Sean Penn. Was there a clue that one of his brothers was going to die ? Was this little boy doomed ? One can't help but search the film (his soul ?) for an answer. The film is messy ? Well, life is messy. Characters don't say much ? So do we, when you think of it. Nothing extraordinary happens ? You know the answer. Unless... you let your imagination run free, and dream of infinite landscapes, blinding lights and secret doors. Unless you watch this drowning clown, this red-haired girl and her white dress. Unless you see the happiness in your garden and hear the mysteries in a whispering voice. I'm glad this film exists. Summary: An original variation on the theme of mourning, with gorgeous cinematography, seamless editing and amazing performances by Brad Pitt and the kids, but lacking emotion. An original variation on theme of mourning, with gorgeous cinematography, seamless editing and amazing performances by Brad pitt and the kids, but lacking emotion. Disagree with our reviews? Let us know your thoughts in the Your Say section.